Are you eco-friendly and already a fan of being as Eco-Friendly with your furniture and other work products as possible? Attractive Recycling Bins ensure that others will share in your green-friendly consciousness. When you place a recycling receptacle next to a trash bin, people are more likely to think before they throw away recyclables! Reduce. Reuse. Recycle! Whether you need a Single Stream Recycling Bin or a Separated Recycling System, there�s a stylish recycling container for you! In your designated smoking areas, marked by Smoking Permitted Signs, place a Cigarette Disposal Receptacle nearby and be sure no cigarette butts litter your sidewalk. Sandless cigarette disposal cans or cigarette Disposal with Sand for snuffing out cigarettes come in several sizes and shapes. Choose a Trash Can-Smoking Receptacle Combination or just a Smoking Stand. Keep smoking contained and cigarettes off the ground to make clean up easier for you. Trash Cans and trash bins of all kinds fit in anywhere. If you need Industrial kitchen trash cans or janitor trash bins, several options are available. 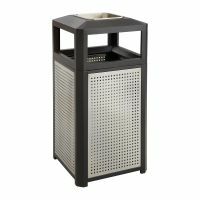 Sleek trash bins, Wooden trash receptacles with flapping doors for restaurants, and Push Top trash cans look great in restaurants and offices. Pedal Trash Cans and Small Wastebaskets for offices, kitchens, and hospitals. Receptacles for Fire Proof Storage for chemicals are safe and keep chemicals contained in Science Labs or construction areas. No matter where you are, work or the park, keep areas clean and be as eco-friendly as you would like with this selection of recycling, waste, and smoking receptacles!